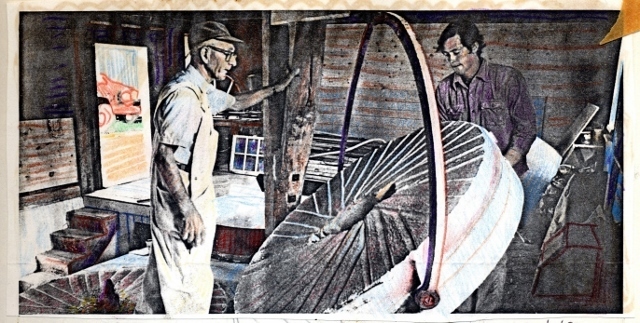 Adamsville’s first mill was established by Philip Taber prior to 1700. Most early mills in the Little Compton area were wind-powered, but in order to saw wood, it was necessary to have water power. The Adamsville mill pond provided power for both a sawmill and a gristmill. The present gristmill dates from the mid-nineteenth century, and it originally used a horizontal water wheel. After a hurricane damaged the original water-powered works, the remnants of a 1946 Cains Mayonnaise truck powered the mill for many years. Today an electric motor turns its historic mill stone and still grinds the finest jonnycake meal. Corn meal pancakes, known as "jonnycakes," have been a staple of the New England diet ever since English settlers discovered that wheat and other grains did not grow well in Little Compton, but corn, central to the local Native American diet, did. They remained a common everyday food well into the twentieth century, frequently eaten with thick cream skimmed from raw milk. Jonnycakes are now a popular local breakfast food. Prepared "thick" in other areas of Rhode Island, Little Compton jonnycakes are preferred "thin." 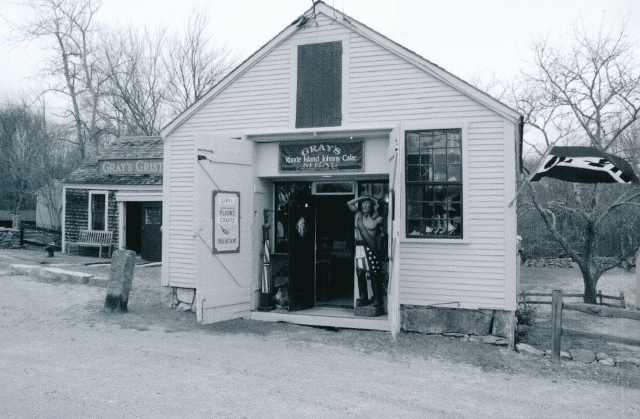 Gray's Grist Mill : This photo of the Gray's Grist Mill store advertises their "Rhode Island Johnny Cake Meal," which in the Little Compton area, could be used to make the thin, crispy johnnycakes preferred by local residents. 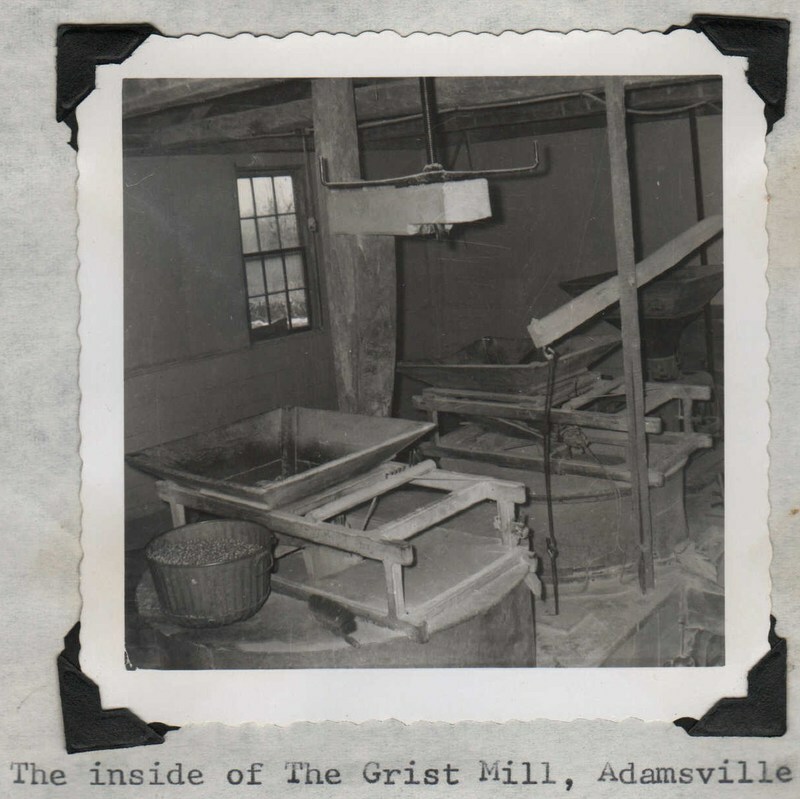 Gray's Grist Mill Interior : Although Gray's Grist Mill is no longer powered with water from the Adamsville pond, the great circular mill stones inside the mill still grind corn into meal using that same process that has been used for hundreds of years. Grist Mill Grinding Stone : This large, circular stone is the moveable "runner stone" of a pair of mill stones that, grinding and turning together, crush kernels of corn into meal. 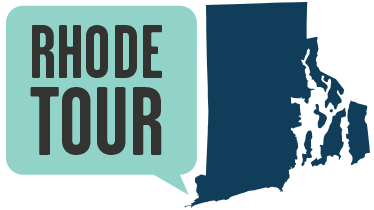 , “Gray's Grist Mill,” Rhode Tour, accessed April 22, 2019, http://rhodetour.org/items/show/121.